Tour Expenses - Since Galapagos was meant to be my birthday treat, I wanted to have a stress free trip and have someone else plan the itinerary for me as I followed along enjoying the ride. Having worked at a travel agency here in Quito, I was fortunate enough to get a discount of $100 so I ended up paying $400 for a tour that normally costs $500 (better than nothing right)? the tour price included: excursions, 3 meals a day, hotel stay, transfer in and out of the airport and a guide. I chose the cheapest tour which lasted 4 days and 3 nights, perfect length of time for me because I didn't want and I couldn't afford to be gone for too long. I opted for a land tour meaning I would be staying in a hotel and only taking boats to whichever island I was to visit. The other option was to take a boat tour meaning I would be staying on a boat and only stepping on land for any excursions included in the itinerary. Let's just stay staying on a boat for majority of the time wasn't my cup of tea, I wanted the flexibility of being on land so that I could do my own thing and go wherever I wanted during my free time. NOTE: The boat tours are more pricey, the cheapest is about $600 but the advantage of these tours is that you get to visit more islands. For my tour I only got to visit two islands, Santa Cruz and Isabela which happens to be the largest island. Flight Prices - Everyone including the owner of the travel agency I worked at in Quito told me that flights to the islands are usually pricey and $400 would be the cheapest price I would get. I went online and true to what I had heard, most flights were charging $400 and upward between Quito and Galapagos. I had even checked the Prices from Guayaquil to Galapagos but they were not any cheaper (Guayaquil is closer to Galapagos) I almost gave up hope until I came across a flight for $275 through expedia. The map below gives you an idea of how far the islands are from mainland Ecuador. Island Expenses - I had to pay $20 for a transit card at the airport in Quito, without this transit card you can not be checked in. At the airport in Galapagos I had to pay an entry fee of $100 which is mandatory for everyone, of course its cheaper for countries that have certain relations with Ecuador. When I visited Isabela island I had to pay an entry fee of $5 as a foreigner (nationals pay $2). 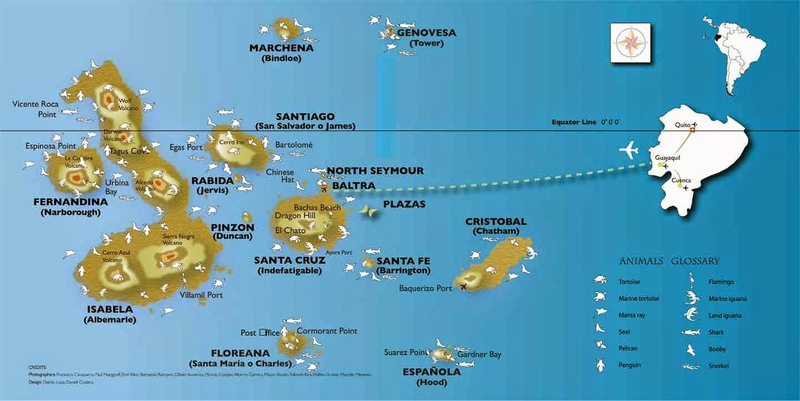 There are two airports at the Galapagos so you can fly either to Baltra which is the main airport or San Cristobal. Most flights do fly to Baltra and from Baltra you can take a boat to the island of Santa Cruz which is the main starting point for a lot of tours and has more accommodation options. Galapagos is an one hour behind continental time in Ecuador so be sure to adjust your watch. Contrary to what I had thought before, you can actually do Galapagos on your own without any tours. Santa Cruz has many accommodation options and serves as the main base for a lot of tourists. Once you book your hostel/hotel in Santa Cruz, you can take day trips to explore other islands by yourself and return in the evening. From talking to some tour guides I found out that there are four islands that you can visit by yourself without a tour guide: Santa Cruz, Isabela, Floreana and I believe San Cristobal. 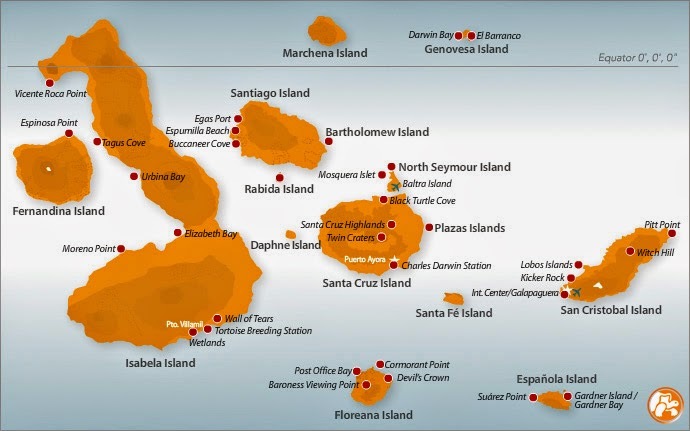 You would need a guide for the others because they are protected islands. If you decide to visit one of the four islands by yourself then you would pay about $25 for a boat ride, I believe the price varies depending on how far the islands are. Had I known what I know now I would have loved to visit a couple more islands. If you don't want to do the islands by yourself you can buy tours in Santa Cruz, each tour costs between $100 - $130 depending on how far the island is, these prices can really add up if you are visiting various islands so that's why it's better to buy a packaged tour. I found out packaged tours are cheaper to buy in the Galapagos because you are buying directly from the tour companies. Bottom Line - I think it all depends on how much you are willing or able to spend, how long you want to visit and of course good planning. Take into account that yes you can do Galapagos on your own but some expenses do add up so its always good to compare different options and see the cost that each option bears.